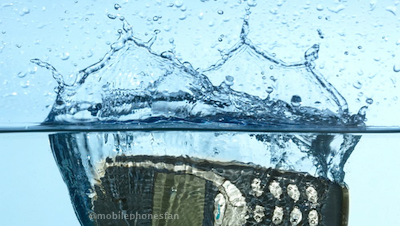 Nokia smart phone sales take a bath. Again. It's a classic Good News/Bad News quarterly report from Gartner. Overall sales of mobile phones hit 419.1 million units, down 2% from this time last year -- the first 1Q drop in three years. Analysts say this reflects fewer products launched in the Asia-Pacific region, in particular during the traditional gift-giving season. Meanwhile, the elite smartphones sector saw continued growth, rising 44.7% year-on-year to 144.4 million units. Android models accounted for 56.1% of smartphone sales, allowing top licensee Samsung to end Nokia's 14-year reign as world's #1 phone maker. 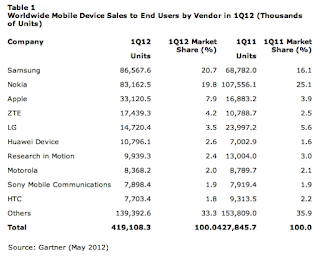 Nokia's suffered a steep 22.7% decrease in total handset sales vs. the first quarter of 2011. Gartner says this reflects a surprising trend: buyers are moving into smartphones more rapidly than expected, away fron Nokia's traditional strength in feature phones. 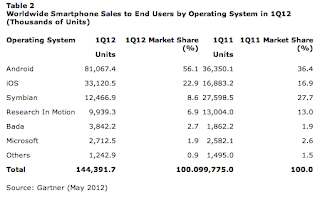 86.6 million shipments in Q1 earned Samsung the market-share lead, at 20.7%. Nokia’s 83.2 million shipments gives them 19.8%, down from last year's 25%. 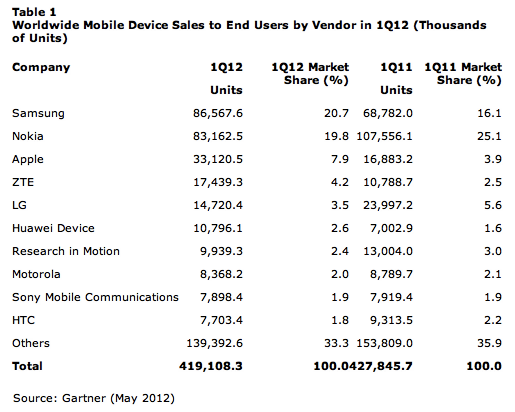 Next, comes Apple (33.1 million units; 7.9%), ZTE (17.4 million units; 4.2%), and LG (14.7 million units; 3.5%). Buoyed in part by strong China results (5 million units), Apple’s iPhone saw remarkable gains -- their 33.1 million units sold in the quarter represents a 96.2% increase over 2011. 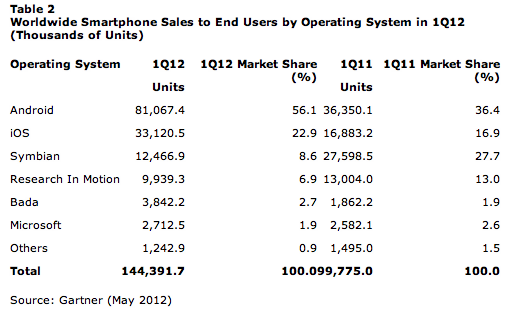 But the resulting 29.1% market-share puts iOS in second place, well behind Android.